Lisa and I got the idea to go see the Reno Aces (our local AAA Minor League Baseball club) game on Friday night. They would be playing the Albuquerque Isotopes. (This team, incidentally, is not a descendant of the former Albuquerque Dukes — that team later moved to Portland (the Beavers) before moving again and is now known as the El Paso Chihuahuas.) So we headed into Reno and went to the game. We got front-row seats, albeit down the left field line. As it happens, we never sat in the seats. About the time we went into the ballpark, it started raining. The tarp was already down on the field. What we originally thought was doing to be a passing shower turned in to a bitterly cold wind-driven rainstorm. We stayed under cover, bought a couple of hot dogs, and hoped for the best, as did a bunch of other people huddling on the concourse of Greater Nevada Field. 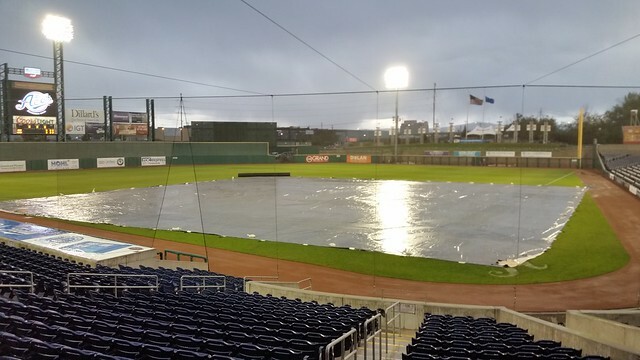 Alas, the rain pounded on, and after a delay of an hour or so after scheduled first pitch, the game was officially postponed. Because the Isotopes won't be coming back to Reno this year, they'll play a "Twi-Night" double-header, starting at 5 PM, with both games shortened to seven innings. Our tickets can be exchanged for another game (possibly tomorrow's double-header, although we're not sure we're up for that, particularly because it will probably be crowded). We weren't especially hungry (those sausages were huge! ), so we bundled up against the rain, made our way back to the car trying to catch as much shelter as we could (including cutting through some of the casinos), and drove home, with a brief stop for some groceries we can't get in Fernley. Along the way I saw the score of the SF Giants game in New York. Ouch. 13-1 Mets win. Sort of glad I wasn't listening to that one.